Gupta, S., Tewari, P., Sharma, A. (2009). A Markov Model for Performance Evaluation of Coal Handling Unit of a Thermal Power Plant. Journal of Industrial and Systems Engineering, 3(2), 85-96. Sorabh Gupta; P.C. Tewari; Avdhesh Kr. Sharma. "A Markov Model for Performance Evaluation of Coal Handling Unit of a Thermal Power Plant". 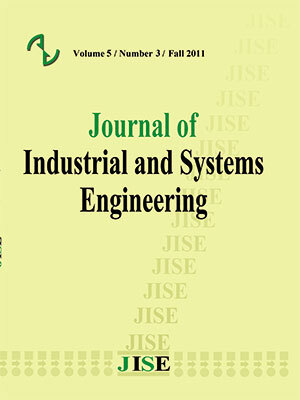 Journal of Industrial and Systems Engineering, 3, 2, 2009, 85-96. Gupta, S., Tewari, P., Sharma, A. (2009). 'A Markov Model for Performance Evaluation of Coal Handling Unit of a Thermal Power Plant', Journal of Industrial and Systems Engineering, 3(2), pp. 85-96. Gupta, S., Tewari, P., Sharma, A. A Markov Model for Performance Evaluation of Coal Handling Unit of a Thermal Power Plant. Journal of Industrial and Systems Engineering, 2009; 3(2): 85-96. The present paper discusses the development of a Markov model for performance evaluation of coal handling unit of a thermal power plant using probabilistic approach. Coal handling unit ensures proper supply of coal for sound functioning of thermal Power Plant. In present paper, the coal handling unit consists of two subsystems with two possible states i.e. working and failed. Failure and repair rates of both subsystems are taken to be constant. After drawing transition diagram, differential equations have been generated. After that, steady state probabilities are determined. Besides, some decision matrices are also developed, which provide various performance levels for different combinations of failure and repair rates of all subsystems. Based upon various performance values obtained in decision matrices and plots of failure rates/ repair rates of various subsystems, performance of each subsystem is analyzed and then maintenance decisions are made for all subsystems. The developed model helps in comparative evaluation of alternative maintenance strategies. power plant; Micro electron Reliability 37(5); 95-99. Balaguruswamy E. (1984), Reliability Engineering, Tata McGraw Hill; New Delhi. journal of quality & reliability management 24(6); 643-657.
software systems; In 23rd Int. Symp. On Fault-Tolerant Computing, Toulouse, France; 668–673. models; Numerical solution to Markov chains, W. Stewart ed. ; 11-37. Petri nets and performance models; Kyoto, Japan; 142–151. Study, MIT Press, Cambridge; MA. International (JIEI); Accepted for publication on 01.03.2009. Engineering Management (MSEM), UK. 1(1); 03-13. Høyland A., Rausand M. (1994), System reliability theory; Wiley, New York. Journal of Industrial Engineering, Udyog Pragati, N.I.T.I.E. Mumbai (India) 32(1); 24-29. Probabilistic Safety Assessment and Risk Management, PSA, Zurich, Switzerland; 588–592. Quality and reliability Engineering international journal 9; 411-423.
a urea fertilizer plant; International Journal of Management and System (IJOMAS) 15(3); 211-214. Misra K.B. (1992), Reliability analysis and prediction; Elsevier, Amsterdam. Third International Symposium on Fault- Tolerant Computing; 674–679. Thesis; Kurukshetra University (REC Kurukshetra), Haryana, INDIA. predictor; AIAA Journal of Guidance, Control and Dynamics 5(May/June); 319–331. analysis for systems with variable configuration; IEEE Transactions on Reliability 41(4); 504–511. and monitoring; In Proc. of Annual Reliability and Maintainability Symposium; 195–200. Srinath L.S. (1994), Reliability engineering; 3rd edition, East-West Press Pvt. Ltd.; New Delhi, India.